Posted: Tue Oct 30, 07 3:29 pm Post subject: bunny liver disease? I just cleaned a rabbit ( acquired from local butcher - pee out , but innards intact, skin on. ) I've always been told to inspect the liver before proceeding to the pot which I did, having skinned him and cleaned him up no problems there but the liver has some hard whitish-yellow lumps on it about the size of flour crumbs before sifting ie 1 mm ish . although the colour is what I'd expect - reddish brown and smooth textured. I've already decided this one is probably best stewed and used for dog food, but we're doing rabbits tomorrow night in my wild food class, and wondered what I should tell the class if another bunny has the same liver problem? is it a recognised disease and am I right in believing you shouldn't eat an animal with a diseased liver? I thought fat too, the same way it accumulates round kidneys. Hard to think what habits rabbits have that would give them liver disease. yes fat it could be, its the right colour. the lumps go right the way through the liver with sort of minute stringy bits connecting them to the liver tissue. I've got it in the fridge, might try and do a photo fwiw. Sounds like it could be fat. We had a batch of chickens once that I overfed with corn - their livers had similar-sounding spots, and overall had a rather yellowish tinge, rather than the deep red that we normally get. They made fantastic p�t�! Did you get any noticeable fat on the rabbit carcase? Any chance it could be some form of parasite, a worm cyst or rabbit Coccidiosis (one type affects the liver), or even something like Viral Haemorrhagic Disease. Might be worth having a google and comparing any pictures to the liver you've got and hopefully confirm it's just fat! no definitely not like the pic of Coccidiosis I also found a sort of lesion /blister inside the liver, about 1cm long, sort of garden slug shaped.... difficult to remove intact - it burst while I was trying and seemed to contain blood or watery blood type stuff. Nothing like I've ever seen before..
the photo's aren't great - too much artificial light. It may well be liver fluke - don't eat it. A nasty little parasite - and you don't want your own liver to end up looking like that. Burn or bury the thing. The rest of the bunny will be ok though. You sometimes get them if the rabbits were taken where there are sheep or cattle - especially if the ground is a bit marshy. thanks everyone, most helpful suggestions. 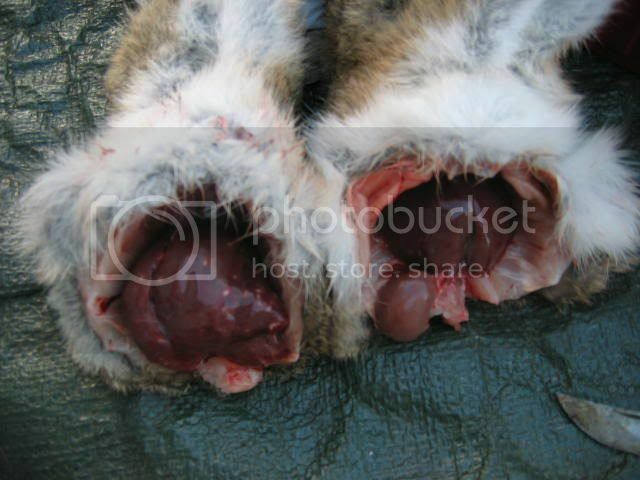 Killitngrillit's LH pic ilooks very similar, but liver fluke pics on the web show dark mottling patches on the liver. But hard to say what stage of the infection it is. the second paragraph of the intro describes what I think I found. here's a couple of not very good pix - you can see the blister/ lesion thingy in the second pic. A night on the town? I would say fat. We get losts of yellow fat on ours but they are fed corn amongst other stuff which I know causes yellow fat in chickens. I know nothing of wild rabbits, sorry. you can see the blister/ lesion thingy in the second pic. Is the brown lump the gall bladder? T - Yes that`s the gall bladder and needs to be removed carefully if you intend to eat the liver. Yes that's the gall bladder and needs to be removed carefully if you intend to eat the liver. should've paid more attention in those biology lessons..